In a bowl, combine the marinade ingredients. Mix half the marinade with the pork belly and set aside to marinate for at least an hour or overnight. Mix the other half of the marinade with the pork mince and form into small patties. Set aside to marinate also. For the pickled papaya, combine the vinegar, sugar and salt in a large bowl. Stir until the sugar dissolves. Add the papaya and set aside for at least 30 minutes. Pickled papaya will keep up to a week in the refrigerator. Make the dressing by heating the fish sauce, vinegar, sugar and water in a saucepan over high heat until the sugar dissolves. Transfer to a bowl and allow to cool. Then stir through the lime juice. Heat a char-grill pan, barbecue plate or frying pan over high heat. Brush with oil and grill the pork belly for 2 minutes each side or until slightly charred and cooked through. Transfer to a serving platter. Brush the pan or plate with oil again and cook the pork patties for 3-4 minutes each side or until slightly charred and cooked through. Transfer to the same serving plate. To serve. Place some of the warm pork belly and pork meatballs into a medium-sized bowl. Spoon over a generous amount of the dressing. Serve with noodles, herbs, lettuce and garlic and chilli. 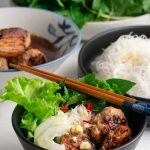 Each person can make their own bowl by adding some noodles, herbs, lettuce, pork and dressing and little amounts of the garlic and chilli to taste.